Now that we’ve got the rest of our house pretty well-organized, we need to start teaching our kids to get organized. Not only will this help you with the job of organizing the house, but it also teaches them how to get organized on their own, which is a wonderful life skill to possess. 1. You need to teach your kids how to organize…they do not automatically know what it means to clean and organize their rooms. My kids and I have decluttered/organized their rooms about 2-3 times a year since they were very small. Usually this happened during a change of season, which required that summer clothes be exchanged for winter clothes, or vice versa. 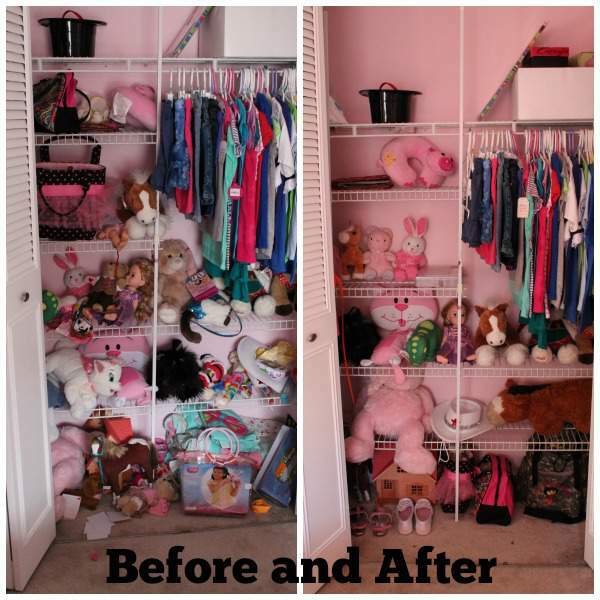 Each time, we went through their closets, purging them of clothing and toys that they had outgrown, and then finding a place for everything so that it was all organized. This semi-annual decluttering/organizing was not the most fun thing to do, and sometimes it took us a full day to get it all done, but it was so worth it! A few weeks ago, while on spring break, my kids decluttered and organized their own rooms almost totally by themselves. They asked me my opinion on whether or not to keep a few items, but did all the cleaning, bagging of trash and donations, and organizing all on their own! I once heard my friend Lisa of Organize 365 say once that organizing and decluttering is something that you have to teach a child…they are not automatically born knowing how to organize. Many moms gets so frustrated with their kids because they will tell the kids to clean their rooms, but the rooms never ended up clean, because the kids had no idea how to do it. I totally agree with this! Taking a few hours a couple of times a year to show your kids how to go through the process will help them learn what a clean and organized room should look like and how to make their room just like that. For example, to my daughter, an old Dora the Explorer doll had become a “baby toy,” but when I looked at it, I remembered when she was a toddler and had to sleep with the doll every night. I wanted her to keep it for the memories, but she wanted to give it away. I recently realized that this was not only leading us to a cluttered up house, but that I was encouraging my daughter to hold onto clutter! Instead of applauding her decision to let go of things she no longer needed or wanted, I was guilting her into keeping stuff. If kids can learn to embrace a clutter-free life when they are small, I think it will pay huge benefits as they grow older and eventually move into homes of their own. One exception to this would be in the case of a family heirloom or other truly special item. When my kids decluttered their rooms a few weeks ago, they decided to go through their old books and donate ones which they had outgrown. I was so busy being proud of them, that I neglected to check the bags of stuff that they had put aside for donation. Turns out that my daughter had given away a Cat in the Hat book that her grandmother had given her as a baby…it was signed on the inside cover with the date. My daughter thought she was too old for the book….rightly so…but I would have liked to put that aside to keep for her own children. If your child is having difficulties parting with any of his toys, take a few minutes to explain about the idea of clutter and why it’s not good for us. 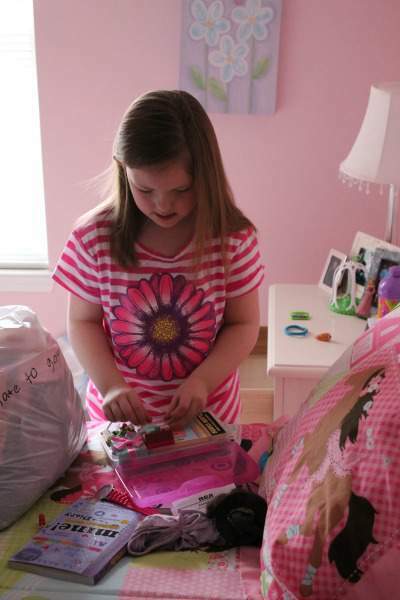 You can also try explaining about what happens when a beloved toy gets donated…my kids are always eager to donate things when I tell them about other kids who might not be able to afford toys of their own. If your child still doesn’t want to let go of a particular item, that’s OK! You don’t want decluttering and organizing to be a terrible experience. I’ve learned that in time, my kids will eventually let go of whatever it was that I wanted to give away…usually because they’ve grown tired of it or simply outgrew it. Now, I will say that there were times when I did go through toys on my own and got rid of things without their permission. These toys were things they had not played with in a very long time, and they truthfully did not even notice when they were gone. I think that’s OK to do if you are truly sure that your kids will not miss what you are throwing out. 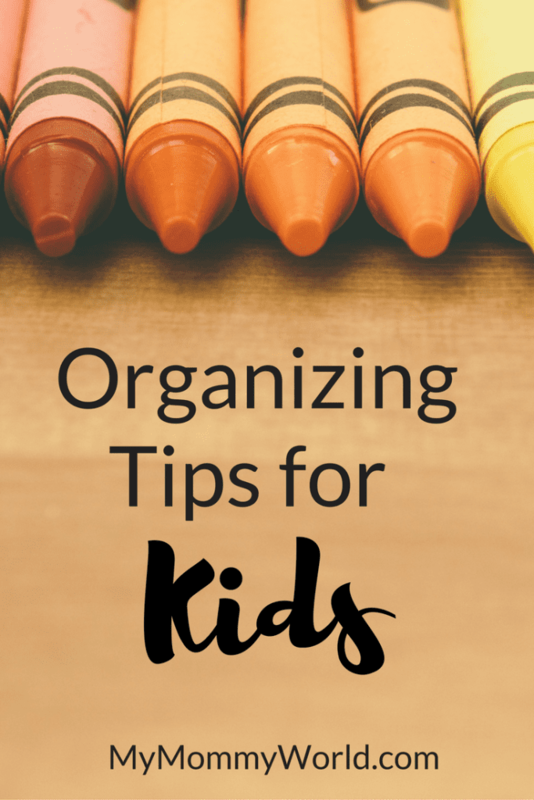 Hopefully these organizing tips for kids will help your whole family get excited about staying organized and clutter-free! I agree that you need to teach your kids to declutter. I’ve been working on teaching them for quite a few years now. My daughter can do a great job of decluttering on her own. My son not so much, he never wants to let anything go. It can really be a struggle. So I give him options, letting him pick between two items and that makes the process a little easier.